For more information or to make an appointment, call 304.264.1314. No referral required. Hyperbaric Oxygen Therapy (HBOT) is a treatment that involves breathing 100% oxygen in a pressurized room or chamber. This treatment increases the amount of oxygen dissolved in the blood. Saturating organs and tissues with critical oxygen yields many health benefits. HBOT reduces inflammation and swelling while helping the body to fight infection. It also stimulates the release of substances called growth factors and stem cells that promote healing and cause formation of new blood vessels. Hyperbaric Oxygen Therapy (HBOT) is a treatment that involves breathing 100% oxygen in a pressurized room or chamber. This treatment increases the amount of oxygen dissolved in the blood. Saturating organs and tissues with critical oxygen yields many health benefits. HBOT reduces inflammation and swelling while helping the body to fight infection. It also stimulates the release of substances called growth factors and stem cells that promote healing and cause formation of new blood vessels. 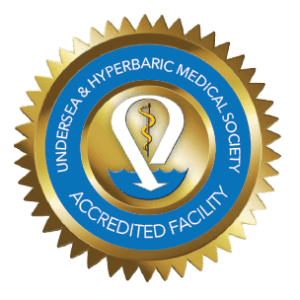 Radionecrosis ranks among the most well-researched and common uses of Hyperbaric Oxygen Therapy. When receiving radiation therapy, there is always a risk damaging nearby soft tissue and bone. This is most common with external beam radiation therapy (EBRT). Necrosis means the death of cells in bones, organs, and soft tissues. Delayed radiation injuries most often stem from scarring and restricted blood flow near the treated site. The linings of blood vessels and the gastrointestinal tract are especially vulnerable to radiation damage. Side effects of radiation therapy may not present a health problem for months or even years after treatment. Some common symptoms of delayed radiation injury are gastrointestinal issues, skin ulceration, and jaw problems after dental work. HBOT works by increasing growth factors and stem cell activity. This improves healing by simulating new blood vessel formation. Restoring blood flow to the damaged areas leads to complete healing and improvement of symptoms for most patients. For more information regarding Hyperbaric Oxygen Therapy or for a consultation, please contact the Center for Wound Care and Hyperbaric Medicine.